Who said Gibraltar is slow? 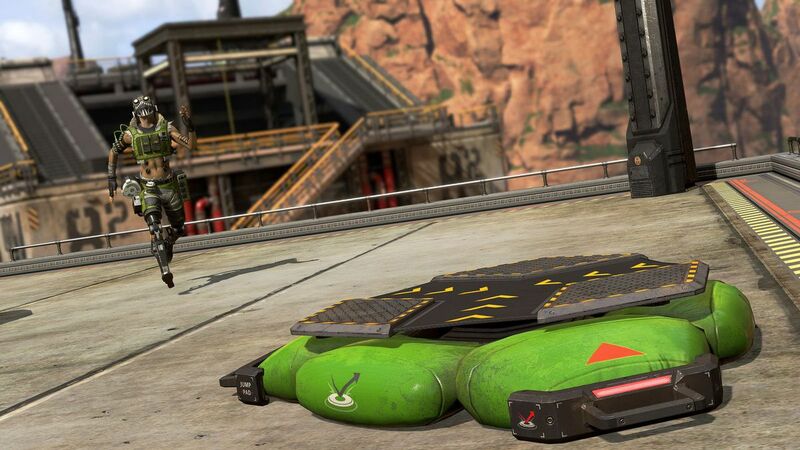 If you think Gibraltar is an underwhelming character in Apex Legends, that’s your fault. You just haven’t learned how to unleash his full potential yet. Players have found that Gibraltar’s arm shield behaves like any other surface in the game, which means his allies can deploy their items on it. So, for example, an Octane can place his ultimate ability Launch Pad on the shield and let Gibraltar hold it as long as his shield is out. As a matter of fact, that’s when the fun starts and Gibraltar can aim down with his shield to active the Launch Pad and jump through the map. When he lands, if he still has his shield up with the item, he can do this again indefinitely. This can be very useful for anyone using Gibraltar. He lacks mobility skills that characters like Octane, Bangalore, and Wraith have—and this can be a problem when trying to flank or just catch an opponent off-guard. This combo with Octane helps Gibraltar move around faster, take new positions efficiently, and even avoid ring damage when he’s running from it. Despite looking like a cheesy or situational strategy, especially when you see it being used to bounce Gibraltar like a toad, players can get creative and use this combo wisely to get an edge over opponents. The Gibraltar and Octane combo with the Launch Pad doesn’t seem to be game-breaking, and in fact, it takes Apex team compositions to a new level. Instead of each character being an accessory to each other, like Lifeline being a med kit or Bangalore being a smoke grenade, Octane helps Gibraltar do something neither of them would be able to do alone, since Gibraltar can’t jump high without the Launch Pad and Octane can’t move it after using the skill. But even so, this interaction is visually weird and might be unintended since Gibraltar’s shield isn’t actually a wall or floor tile. Respawn has refrained from commenting on whether this is intended.